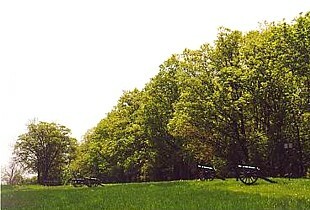 Pitzer Woods was contested ground during the Battle of Gettysburg on July 1-2, 1863. South Seminary Ridge is the portion of the battlefield south of an east-west branch of Pitzer Run, which separates South Seminary Ridge from a separate landform to the north on the west of Gettysburg with the Lutheran Theological Seminary at Gettysburg. South of the Pitzer Run branch, the ridgeline of South Seminary Ridge extends from Pitzer Woods, across the Millerstown Road. The first day at Gettysburg—more significant than simply a prelude to the bloody second and third days—ranks as the 23rd largest battle of the war by number of troops engaged. About one quarter of Meade's army (22,000 men) and one third of Lee's army (27,000) were engaged. Union casualties were almost 9,000, Confederate slightly more than 6,000. The first day of the battle of Gettysburg (at McPherson’s Ridge, Oak Hill, Oak Ridge, Seminary Ridge, Barlow’s Knoll and in and around the town) involved some 50,000 soldiers of which roughly 15,500 were killed, wounded, captured or missing. The initial day in itself ranks as the 12th bloodiest battle of the Civil War. The second day of the battle, July 2, was the largest and costliest of the three days. The second day’s fighting (at Devil’s Den, Little Round Top, the Wheatfield, the Peach Orchard, Cemetery Ridge, Trostle’s Farm, Culp’s Hill and Cemetery Hill) involved at least 100,000 soldiers of which roughly 20,000 were killed, wounded, captured or missing. The second day in itself ranks as the 10th bloodiest battle of the Civil War—with far more casualties than the much larger Battle of Fredericksburg. On the first day of the Battle of Gettysburg, Cemetery Ridge was unoccupied for much of the day until the Union army retreated from its positions north of town, when the divisions of Brig. Gen. John C. Robinson and Maj. Gen. Abner Doubleday from the I Corps were placed on the northern end of the ridge, protecting the left flank of the XI Corps on Cemetery Hill. After the XII Corps arrived, Maj. Gen. John W. Geary's Second Division was sent to the southern end of the ridge near Little Round Top; Brig. Gen. John Buford's cavalry division formed a skirmish line in the fields between Cemetery Ridge and Seminary Ridge. The III Corps arrived about 8 p.m. and replaced Geary's division (which was sent to Culp's Hill); the II Corps arrived about 10:30 p.m. and camped immediately behind the III Corps. During the morning of the 2nd day (July 2), Army of the Potomac commander Maj. Gen. George G. Meade shifted units to receive an expected Confederate attack on his positions. The II Corps was placed in the center of Cemetery Ridge, with Brig. Gen. Alexander Hays's division on the corps' right, John Gibbon's division in the center around the Angle, and John C. Caldwell's division on the left, adjacent to the III Corps; Robinson's division of the I Corps was placed in reserve behind the XI Corps. The V Corps was formed in reserve behind the II Corps. In the late afternoon, the end of the Confederate Maj. Gen. Lafayette McLaws's assault drove portions of Maj. Gen. Daniel Sickles's III Corps line back to the southern end of Cemetery Ridge, and Brig. Gen. Ambrose Wright's Confederate brigade temporarily captured the southern end of the Angle before being driven back to Seminary Ridge by the Philadelphia Brigade. On July 3, fighting resumed on Culp's Hill, and cavalry battles raged to the east and south, but the main event was a dramatic infantry assault by 12,000 Confederates, known as Pickett's Charge, against the center of the Union line on Cemetery Ridge. The charge was repulsed by Union rifle and artillery fire, at great losses to the Confederate army. Lee led his army on a torturous retreat back to Virginia. As many as 51,000 soldiers from both armies were killed, wounded, captured or missing in the three-day battle. Owned at the time of the battle by farmer Samuel Pitzer, this plot of oaks and maples stands at the southern tip of Seminary Ridge and marks its juncture with Warfield Ridge. The woods had no significance at all to the Gettysburg landscape until certain events took place here on July 2. Just prior to midday, the 1st United States Sharpshooters were ordered by Major General Daniel Sickles, commander of the Union Third Corps, to scout this patch of woods. Accompanied by members of the 3rd Maine Infantry, the sharpshooters encountered Alabama soldiers from Brig. General Cadmus Wilcox's Brigade. A brisk fire fight broke out and though it lasted only a few moments, the Union soldiers withdrew with the knowledge that the woods on Seminary Ridge were teeming with Confederates. Returning to Cemetery Ridge, they reported their encounter to General Sickles who realized that the number of Confederates in those woods meant only one thing- a heavy, concentrated attack on his corps from the west. Sickles sent a courier to General Meade with the information, followed by another courier a half hour later. 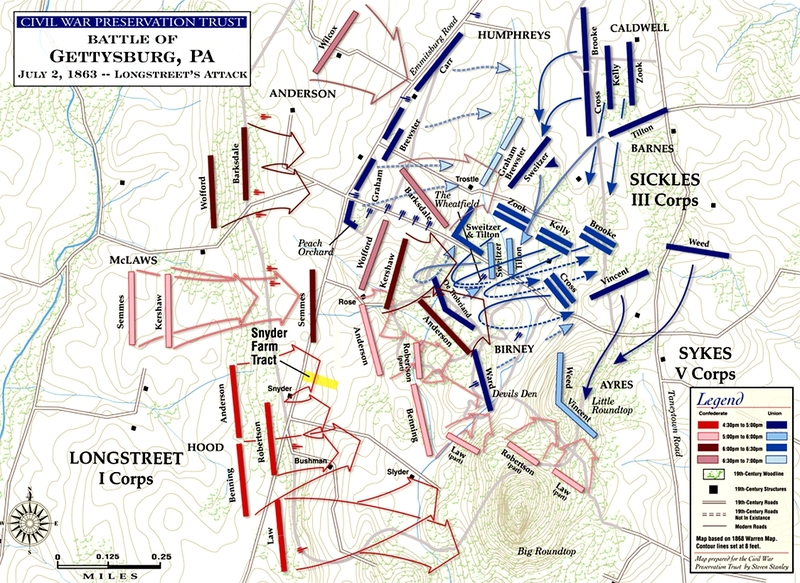 Another hour passed and having received no response from Meade, Sickles decided to advance his corps to the Emmitsburg Road, the only high ground between the two ridges where he would meet the attack before they'd taken possession of it. This controversial decision separated his corps from the remainder of the Union army, which still lay on Cemetery Ridge. Later that afternoon, Confederate troops of Lieutenant General James Longstreet's Corps marched into this area, with the left of his line anchored in Pitzer Woods by the Mississippi Brigade of Brig. General William Barksdale. The Georgia brigade of Brig. General W.T. Wofford formed just outside of the woods, but close behind Barksdale's men who were thankful for the shade under which they rested. The objective for Barksdale and Wofford was to attack Union troops forming on the Emmitsburg Road and the salient of the advanced line at the Peach Orchard. Just before 4 o'clock, Confederate artillery along this portion of Seminary Ridge opened fire on the Union batteries stationed in the Peach Orchard. Huddling in the woods, the Mississippi troops listened to the boom of the guns and screech of Union shells crashing through the trees above them. Impatient that his part of the attack was delayed until other troops had gone in first, a fuming Barksdale stormed up and down, stopping only to petition his division commander for permission to go into the attack early. 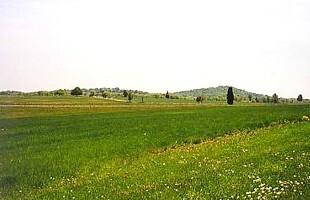 (Left) View toward the Peach Orchard from Pitzer Woods. Barksdale's Brigade charged over this open field toward Union defenders in the distance. The Round Tops rise in the distance just beyond the orchard. Photo Gettysburg NMP. Almost two hours into the attack, the hot tempered general was given permission to move forward in support of Confederate troops advancing on their right. Barksdale ordered his men to the eastern edge of the woods where the Mississippians dressed their ranks and went to the position of "parade rest" while Union shells burst around them. Though considered a senior in age, General Barksdale was a fiery and fearless leader in battle whose face appeared to "glow with excitement at the prospect of battle." Dressed in a resplendent gray officer's coat highlighted with gold trim, his long gray hair flowing almost to the collar, Barksdale spurred his black charger to the front of his old regiment, the 13th Mississippi. Above the din of battle, the general spoke a few words of encouragement. He then waved his hat as a signal to begin the charge and his brigade moved forward in an unstoppable wave. The Mississippi Brigade raced across open fields and sliced through the Union line. It was "The most magnificent charge of the war," as one eyewitness called it. Despite the heroic efforts of two Union regiments near the Sherfy House to slow the Mississippians, Barksdale's soldiers broke through the shaken Union defenders in the Peach Orchard and the precarious Union line began to collapse. Wofford's Georgians followed in Barksdale's path and eventually drove in the last defenders of the orchard before they reached the Wheatfield and beyond, which you will visit as you continue the tour. Samuel Pitzer's farmhouse still stands today, approximately 400 yards west of the woods for which he is named, and is today part of Eisenhower National Historic Site. The size and shape of these woods has changed very little since the battle, despite the placement of a Civilian Conservation Corps camp here in 1935 and the park amphitheater installed within the woods during the 1960's. 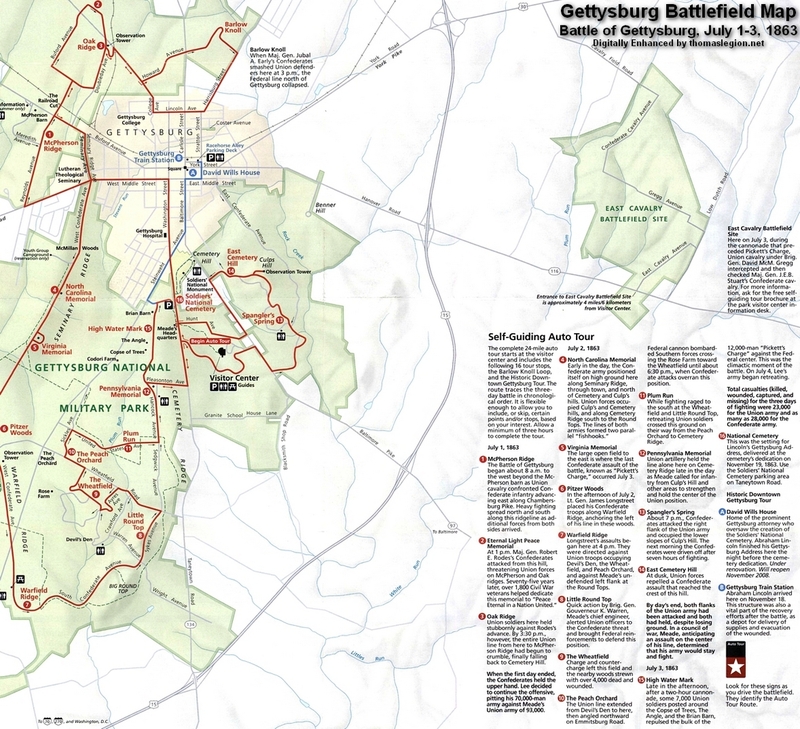 The 1999 General Management Plan for Gettysburg National Military Park calls for the relocation of the amphitheater in the near future, and Pitzer Woods will return to its 1863 appearance. The Mississippi State Monument stands near this location, selected for this site because of the service of General Barksdale's Mississippi Brigade on July 2. Dedicated in 1973, the bronze soldiers atop the polished granite base depict the fighting spirit of the Mississippi soldiers who fought at Gettysburg. 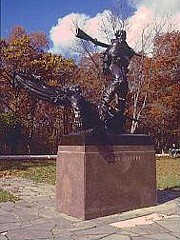 Sculptor Donald DeLue wrote that the monument, "expresses (the) bitter fighting on both sides. But, here on the Confederate side the tide has turned against them, ammunition gone, the flag down, only the courage of desperation remains to the courageous young soldier...", which aptly describes the closing scenes of Barksdale's charge, which not only broke the advanced Union line at the Peach Orchard, but also threatened to open a serious breach in the center of the Union line on Cemetery Ridge. Only the most desperate of measures taken by Union defenders threw the Mississippi regiments back. (Right) The Mississippi State Monument. Adjacent to the Mississippi Monument is the Louisiana State Monument, also sculpted by DeLue, and dedicated in 1971. 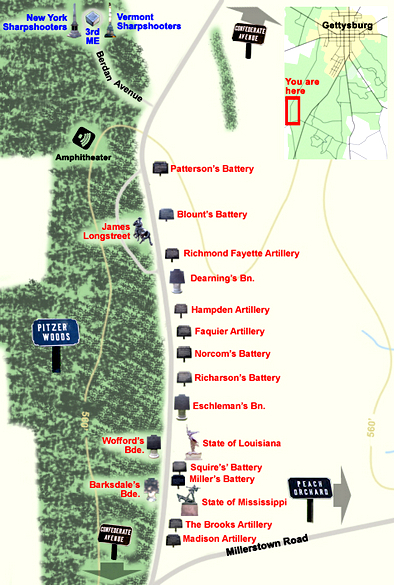 The famed "Washington Artillery of New Orleans" was positioned near this location on July 2 and pushed forward to the Peach Orchard on July 3, prior to the bombardment of the Union line. It was two guns from the Washington Artillery that fired the opening shots to begin the cannonade prior to "Pickett's Charge". Behind both monuments and set within Pitzer Woods, stands the monument to General James Longstreet sculpted by Gary Casteel. One of the more recent monuments on the battlefield, it was sponsored by the North Carolina Division of the Sons of Confederate Veterans and dedicated on July 3, 1998. Also within Pitzer Woods is Berdan Avenue, which leads from West Confederate Avenue to a small cul-de-sac where three monuments stand. Two of these are to companies of the 1st United States Sharpshooters, often referred to as "Berdan's Sharpshooters". At the beginning of the Civil War, Hiram Berdan submitted a proposal to the US War Department to raise a regiment of soldiers who were expert marksmen. The regiment would be composed of companies from Northern or "loyal" states, and to qualify for enlistment in the sharpshooters, men had to be able to hit a target with ten consecutive bulls eyes at 200 yards. Men could provide their own weapons or rely on a rifle given by the government. There was such a clamor of men to join the sharpshooters that two regiments were raised. Berdan was appointed colonel of the 1st USSS and organized his first regiment at Weehawken, New York. The 2nd Regiment soon joined the 1st and both units were uniformed with a distinctive green coat, cap and trousers made of fine wool broadcloth that gave them the nickname of "Green Coats". Even more distinctive were the accurate Colt Revolving Rifles and breech-loading Sharps Rifles that Colonel Berdan secured for both regiments. The US Sharpshooters saw their first combat during the Seven Days Battles before Richmond and then were active throughout all of the campaigns of the Army of the Potomac. At Gettysburg, Company F (Vermont troops) 1st USSS, was one of the companies sent forward by General Sickles to reconnoiter the front of the Third Corps. It was at the spot where their monument sits that the sharpshooters engaged several regiments of General Cadmus Wilcox's Brigade. The distinctive marble shaft and hand-carved stone eagle atop the monument were both knocked over and shattered by a falling tree during a windstorm in 1991. It was only through the interest and donations of outside parties that the shaft and eagle were restored to the monument in May 2000. They range from the equestrian monument to Union general John Reynolds to Amos Humiston, a New Yorker identified several months after the battle when family daguerreotypes found on his body were recognized by his widow. Indeed, while McPherson does the expected fine job of narrating the battle, in a manner suitable for the almost complete tyro in military history, he also skillfully hands out kudos and criticism each time he comes to a memorial. He praises Joshua Chamberlain and the 20th Maine, but also the 140th New York and its colonel, who died leading his regiment on the other Union flank in an equally desperate action. The cover is effective and moving: the quiet clean battlefield park above, the strewn bodies below. The author's knack for knocking myths on the head without jargon or insult is on display throughout: he gently points out that North Carolinians think that their General Pettigrew ought to share credit for Pickett's charge; that General Lee's possible illness is no excuse for the butchery that charge led to; that African-Americans were left out of the veterans' reunions; and that the kidnapping of African-Americans by the Confederates has been excised from most history books. Recommended Reading: The Gettysburg Companion: A Guide to the Most Famous Battle of the Civil War (Hardcover). Description: There have been many books about Gettysburg, but never one to rival this in scale or authority. Based on extensive research, The Gettysburg Companion describes the battle in detail, drawing on firsthand accounts of participants on all sides in order to give the reader a vivid sense of what it was like to experience the carnage at Gettysburg in early July 1863. The many full-color maps--all specially commissioned for the book--and the numerous photographs, charts, and diagrams make this book a feast for the eyes and a collector's dream. Includes a massive library of 500 color illustrations.